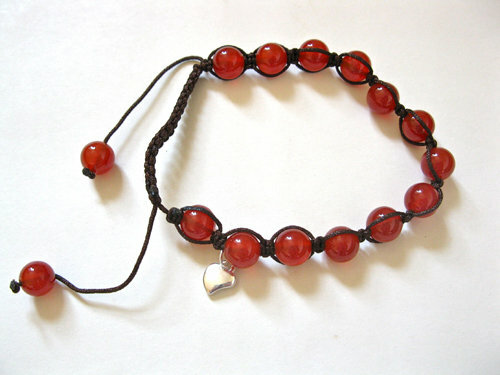 This attractive Carnelian shamballa bracelet consists of rich russet-coloured Carnelian beads set in the traditional Shamballa macramé knotted cord, and a little inspirational heart charm. The bracelet measures approx 20cms round but may be extended. CARNELIAN: The Vitality gemstone. Carnelian is a 'power' stone. It is thought to bring passion to the wearer and therefore great for a Valentine or Anniversary gift. It was believed by the Romans to shore up confidence and strength and is thought to increase physical energy and strength making it the ideal gift for Competitors . . for the big Match, Game, or Competition, and also for Vitality on a Special Day. It is also associated with the star sign Scorpio. SHAMBALLA: The word Shamballa comes from ancient Buddhism. In both Tibetan and Indian Buddhism, Shambhala (also spelt Shambala or Shamballa) is a mythical kingdom hidden somewhere in Inner Asia and is supposed to symbolise purity. It is mentioned in various ancient scripts and concerns high spiritual ideals. Over the centuries, Shambhala has become associated with a so-called Pure Land, a fabulous kingdom whose reality is visionary or spiritual rather than purely physical or geographical. It was in this form that the Shambhala myth reached the West, where it has influenced non-Buddhist as well as Buddhist spiritual seekers. Consequently, Shamballa jewellery is said to impart purity, tranquility and personal happiness onto the person wearing it and, when coupled with a particular gemstone (that has its own individual significance), a Shambala bracelet can be a powerful piece of 'Jewellery with Meaning. A lovely present to help a friend / loved-one achieve their goals. Comes gift-wrapped, like all our presents - and we can print a personal message on your behalf.